Guest Contributor Tony Lizza last wrote about his experiences at the Antiques Road Show. Bedbugs had attacked my apartment. Bedbugs–pests, scourges of Brooklyn, instant transformers of dwellings from Good Deal to Not, had been reported here for months, but in a fit of narcissistic pique I had always assumed I’d be spared. I crafted a series of creaky rationalizations to myself to justify my belief that they would never come my way. “I’m not home often enough to get bedbugs.” “I don’t have much furniture.” “Bedbugs can’t reach the 10th floor.” When I went to bed one night and awoke the next morning with an archipelago of red welts on my chest, I knew I had a problem. Since then, my apartment has been doused with pesticides twice and counting. I have wrapped my possessions in plastic and garbage bags. I know what it is like to bathe in Diatomaceous Earth. Days turned to weeks. Finally, a packet of stapled papers at my door informed me that my apartment was to be sprayed for bedbugs in two days and contained instructions for preparing my apartment, which consisted of disassembling my bed, placing all of my bedding and clothes into plastic bags and removing them from the apartment, and, finally, moving all of my furniture to the middle of the apartment. 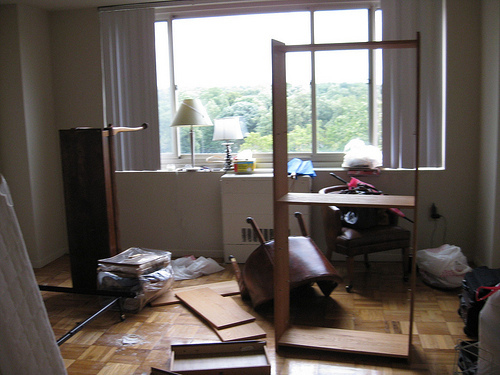 I came home to find my entire room had been tossed—ransacked, even. 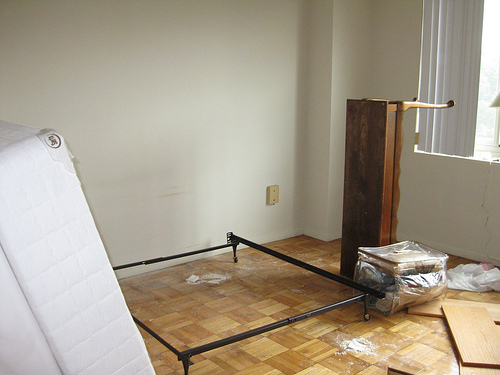 The exterminators had flung the mattress across the room and completely eviscerated my box spring. My desk was turned on its side, its drawers removed and laid on the floor next to it. My bookshelf had been taken apart. I made my bed, wheezing and sneezing and red-faced from the aerosolized poison floating about in my apartment, and laid down on it that night only to awake to fresh bites and a bedbug crawling on my wall that left a massive pocket of blood behind when I smacked it with a shoe. I was going to have to step up my game. That night, I scored some Diatomaceous Earth at a hardware store. Diatomaceous Earth is an off-white sedimentary rock made of algae that, when viewed under a microscope, looks like the contents of someone’s junk drawer. When pulverized, it makes a powerful insecticide that works by extracting fat from a bug’s exoskeleton, dehydrating it. That sounded like a perfectly torturous death for these vermin. I laid down a small mountain of DE on the legs of my bed frame, sprinkled a thick layer on top of my box spring and drizzled some on top of my mattress cover. Again, I woke up with bites. Days later, the exterminators returned. This time I decided I’d stick around and talk to them as they went about their business of ridding me of bedbugs Once And For All. The exterminators themselves were a couple of hard-working, dedicated men who were contracted by my building’s management to deal with the infestation. I got a chance to chat with them for a bit. They said that the building, while not completely infested, did have its fair share of cases. They also said a major problem with fighting bedbugs in an apartment building is that residents frequently don’t report infestations. As with most things, early detection can stop them from spreading. After hearing this, I had to conclude that the building’s management is either incredibly stupid or monumentally cynical. The fact that they don’t aggressively empower residents to contact management at the first sign of a bug bite suggests stupidity. But, I have to assume that they too know the power of early detection and choose not to make a public issue to avoid negative publicity or at least, off-line negative publicity—sites like bedbugregistry.com have featured my building in the past—in which case it smacks of cynicism. through millennia of civilization, it must be just a hint of what our distant ancestors might have felt whenever they left the cave—namely, a feeling like they have might have ended up as food. I haven’t been bitten now in several days, though, which is a good sign. Now I can finally get to work on the mold problem.